Day 32 in Beijing: What You Can Buy For $2.50 American Dollars In Beijing. What You Can Buy For $2.50 American Dollars In Beijing. This is dealing strictly with food and nothing else at this point. That is because I’ve mostly been dealing with eating, drinking and going salsa dancing. I’ve also had to outfit my apartment but that will be dealt with at a later date. So, I’ve mentioned 7-11 a few different times and that is because it is an easy place to shop for food in Beijing. The people are friendly, the food is good, and the quality is actually quite decent. It is, like most convenience stores, a bit more expensive than your grocery store. What you get in speed and ease you end up paying for. And so it goes. 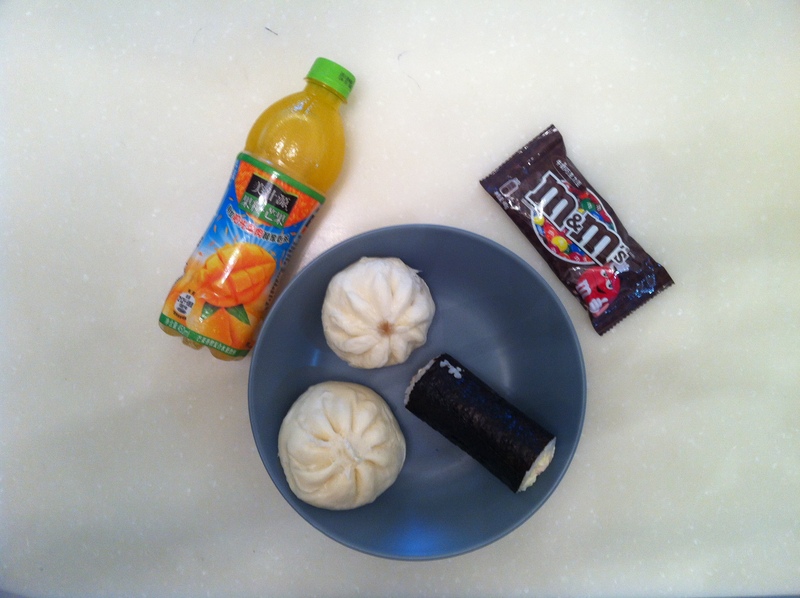 This was a lunch that I bought at 7-11 a few days ago. The bowl is my own but other than that, everything you see here costs $2.50 American dollars. There are two different types of buns, both filled with meat or a bean paste. There is a cylinder sushi roll. There is a medium sized orange juice soda. And, last but not least, that famous Chinese dessert, M&Ms. Let me just state that it was delicious. The first bun was probably beef and had a very nice texture and cooked in an appetizing sauce. The second bun was a yellow bean paste and it was sweet and yummy. The sushi was fresh and I love the taste of shrimp so it was perfect. The orange juice type soda was crisp and sweet with a bit of a sour tang to it. Just what I needed to wash down this quick meal. Just a little bit of his old home in his new home.